Warning: This article contains spoilers for the first two episodes of Emerald City, NBC's new series based on The Wizard of Oz. Tarsem Singh, the director who made a splash in the peak MTV era with his video for R.E.M. 's "Losing My Religion," hasn't worked much in Hollywood over the past quarter-century. And while none of his films since are considered to be classics, exactly, Singh cemented an audacious and unconventional reputation with flamboyant epics like The Fall (one of our overlooked favorites) and the Julia Roberts-led Snow White riff Mirror/Mirror. Consequently, Emerald City producers David Schulner and Shaun Cassidy (yes, that Shaun Cassidy) enticed Singh to helm Emerald City, their deconstruction and reassembly of The Wizard of Oz movie (not L. Frank Baum's source stories) as we know it. The dark and spectacular two-part premiere laid down the gauntlet, and left us with plenty to ponder. 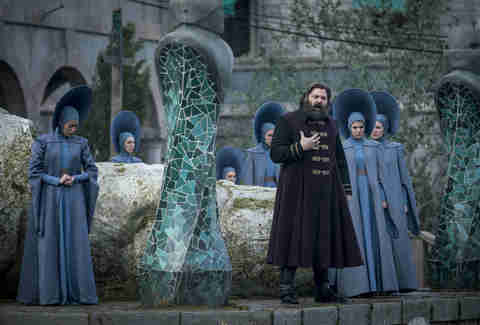 Here are the 10 questions we're all asking after watching Emerald City episodes one and two -- along with something approaching possible insight. Who's the dead guy in the trailer? Did someone try to kill Dorothy's mother, Karen, only to underestimate their intended victim and wind up DOA? It may well have been someone dispatched to put an end to her hobbyist storm-tracking. Someone from another dimension, perhaps? Anyhow, Karen's in bad shape and -- last we see her -- more or less left to die in her bomb shelter while Dorothy gets transported to Oz. But that dead dude has "My identity will be revealed when the moment is right" written all over him. Actually, he has nothing written all over him, but he is dead. We think. 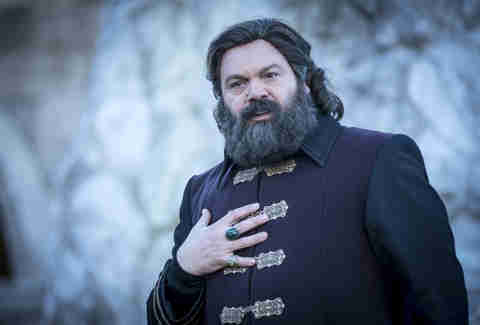 Is Vincent D'Onofrio intentionally aping late-period Orson Welles? Look: Here's Orson Welles as Falstaff, and above is D'Onofrio as the Wizard. Seems more than a touch of homage, but also an overly directed role that D'Onofrio appears to force himself into like the bespoke neo-aristocratic suits he's burdened with. The Wizard is a real wild card thus far: possibly authoritarian, definitely paranoid, maybe well-intentioned, but without a doubt more than cannily resembling filmdom's greatest magician. So, the scarecrow/Lucas isn't missing a brain so much as memory? That would appear to be the liberty taken, at least relative to Ray Bolger's goofy embodiment of Dorothy's scarecrow sidekick in Victor Fleming's film. Besides, Lucas has to have some smarts: he clearly sizes up his new companion as a compelling love interest on a journey that could lead him back to, or freely toward, his true self. OK, perhaps that's not all on the surface yet, but point is: this scarecrow is more symbolic of self-manifestation than archetypal of sweet, asexual comic relief. Is the Witch of the East actually dead? Doubtful. She's been pretty front and center in TV spots and promo photos running up to the premiere, so that would be a fairly anticlimactic (or hollow, in this case) conclusion. Nothing is what it seems in a place still governed as much by sorcery as sober wit, and while Oz had never seen a bullet -- nevermind witnessed the effects of one shattering a witch's skull -- up till now, Dorothy has no idea what kind of defenses the witch and her kin can summon against Earthly weapons, even after their intended effect. There's also some kind of allegory in there about the figurative recoil of weaponized killing and/or the wishful fulfillment of undoing emotional damage that takes a lethal toll, but they'll get around to all that. Did the Witch of the West learn her moves from The OA? Would it really be a reach to ponder whether Emerald City choreographer Viktória Jaross found inspiration in this guy, who conjured The OA's infamous "five movements," when firing up West's funereal boogie? Is Karen the mother of the South? It would make an awful lot of sense, and also validate that Dorothy is the final and maybe most powerful witch, despite the Wizard's overconfidence that South is dead, gone, and bore no more kin after East, West, and North. He may have been neglecting -- or just not imagining -- the possibility of a territory off his map of understanding, one that requires philosophical will as much as tactical breadth to access. So the real question, then, is whether Oz is merely something to be stirred from or more of a concrete parallel world, and if coexistence is simply a dream. Is the prison of the abject pure hallucination? We watch as East creeps inside Dorothy and Lucas's consciousness and keeps them captive in the dark and twisty mire, though Eamonn (who seems likely to be a future ally of Lucas and Dorothy) and his fellow guards wend their way through it IRL, fluid as such planes are in Emerald City. It's very reasonable to assume that whatever spell East concocted to open up the witches' detention center allowed for it to exist in a kind of purgatorial unreality -- a telepathic illusion and 3-D nightmare all the same. Man, I really hope that East isn't dead. Anna's got a spark, huh? The Wizard blinded her with science, yet she was handpicked from Glinda's coven to offer ethereal counsel to the great and powerful one (man, that guy really likes to have his cake and eat it too, pun intended). Her attire blends in with that of Elizabeth and other new-agey ages, but her sharp features and independent curiosity both signal that she's something different. If Jerry Seinfeld were the jester of Emerald City, he might wonder aloud what, in fact, is the deal with Anna. Does Jack know all there is to know about The Crying Game? Well he better study up, because his buddy Tip just jumped ship and came back as a buxom beauty. Zoinks. There's a whole lot to unpack from our introduction to kept boy Tip, who's been held against his will since birth by a mysterious lady shaman (big score casting Fiona Shaw, by the way) intent on dosing him daily with meds for his "bad blood" and otherwise quarantining him like a damsel in distress. Appropriate, given the end-of-episode revelation. But is Tip really a she, or is just someone altogether different, whom the primitive culture of Oz and Emerald City isn't yet prepared to accept and understand? What's for certain is no one's more confused than Tip's pubescent BFF Jack. And that Tip's keeper isn't quite yet in the crypt, despite Dorothy and Lucas's best. Zoinks, indeed. What is this beast that burdens Emerald City? West indicates that the Wizard was just a boy when last it rose, but the Wizard then regales his followers with the tale of how the "beast forever" came and conquered 20 years ago. So, firstly, and bearing in mind the Wizard's hair loss, how does the passage of time work where they're from? But moreover, it'd be hard to overlook that 20 years ago is when Dorothy came into the world, or crazy recluse lady's spiel about us all wishing we had someone to take care of us forever from the second we're born. Depending on whom you ask, Dorothy could well be beauty or beast, or maybe even the Wizard's child he forsook along with Karen. With eight more hours to go this season, there may not be enough opium in Oz or anywhere else to foresee an answer. Kenny Herzog has been watching The Wizard of Oz a lot lately with his son, but will definitely not be showing him Emerald City. However, one day he hopes to introduce him to Tarsem' Singhs The Fall. He's on Twitter @kennyherzog.